What is the real story behind Miguel's family history? Miguel and Dante stroll through the Land of the Dead! Charming statue based on the movie Coco. 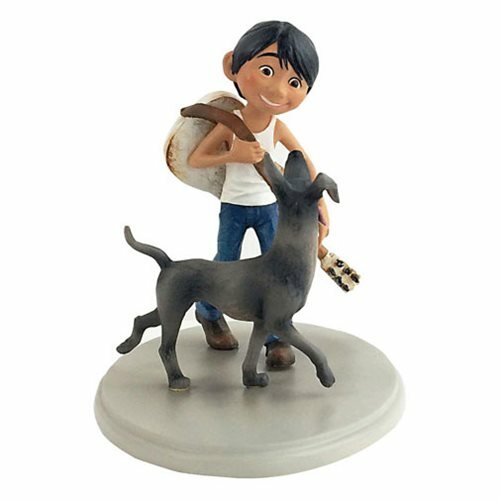 Miguel and Dante from the movie Coco make their Disney Showcase debut as this charming stone resin Disney Showcase Coco Miguel and Dante Statue. With his powerful guitar slung over his shoulder, the aspiring musician and his faithful dog make a delightful duo as they stroll through the realm of the dead on Dia de los Muertos. Will they discover the real story behind Miguel's family history? Ages 14 and up.